Did Pakistan Know Where Bin Laden Was Hiding? U.S. Special Forces killed the terrorist leader in a city that has a heavy Pakistani military presence. Questions about whether Pakistani officials knew bin Laden was there — or why they didn't know — threaten to tear at already frayed U.S.-Pakistani relations. Did Pakistan Know Where Bin Laden Was Hiding? Gen. Ashfaq Kayani, the Pakistani army chief of staff, spoke to cadets at the Kakul Military Academy on April 23. "The terrorists' backbone has been broken and, inshallah [God willing], we will soon prevail," he said in his speech, which was broadcast on state television. The fact that Osama bin Laden was living roughly a mile away from Kakul in a fortified compound has proved embarrassing both for the Pakistani military and for its civilian government, calling into question whether they knew about his presence in Abbottabad — or how they could have failed to know. "I think that the Pakistani army and intelligence have a lot of questions to answer, given the location, the length of time and the apparent fact that this facility was built for bin Laden, and its closeness to the central location to the Pakistani army," Carl Levin (D-MI), who chairs the Senate Armed Services committee, told reporters Monday. "A lot of people on our side wonder how this could have happened without the Pakistanis knowing," says Daniel Markey, a senior fellow at the Council on Foreign Relations. "If they weren't complicit, they were incompetent, so why should we bother partnering with them?" A lot of people on our side wonder how this could have happened without the Pakistanis knowing. If they weren't complicit, they were incompetent, so why should we bother partnering with them? Both the U.S. and Pakistan have depended heavily on each other over the past decade. The U.S. has sent billions of dollars in military and economic assistance to Pakistan, which has been an essential if not always perfect ally both in fighting terrorism and prosecuting the war in neighboring Afghanistan. Relations had weakened during recent months, however. And the question of how bin Laden came to be living in a densely populated city 35 miles from the capital, Islamabad, is bound to cause further tensions. "The best possible outcome of this is that it will cause both sides to do some fundamental thinking about the relationship," says Richard Fontaine, a former foreign policy adviser to Sen. John McCain (R-AZ). But, he adds, "It's possible that the relationship with Pakistan will be a casualty of this." Abbottabad is home not only to the military academy but to a large number of retired and active military officers. The compound in which bin Laden was killed by U.S. Special Forces "has been in existence for roughly five years," according to a senior Obama administration official. 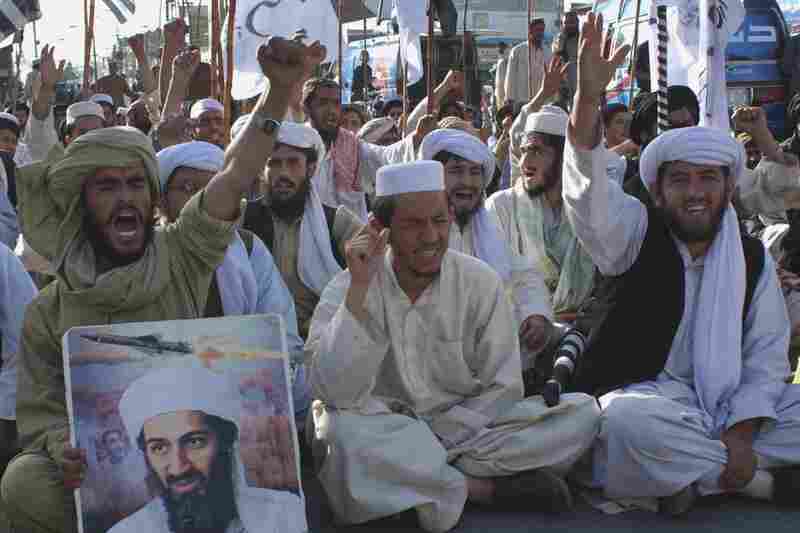 Supporters of Pakistani religious party Jamiat Ulema-e-Islam in Quetta, Pakistan, rally to condemn the killing of Osama bin Laden on Monday. 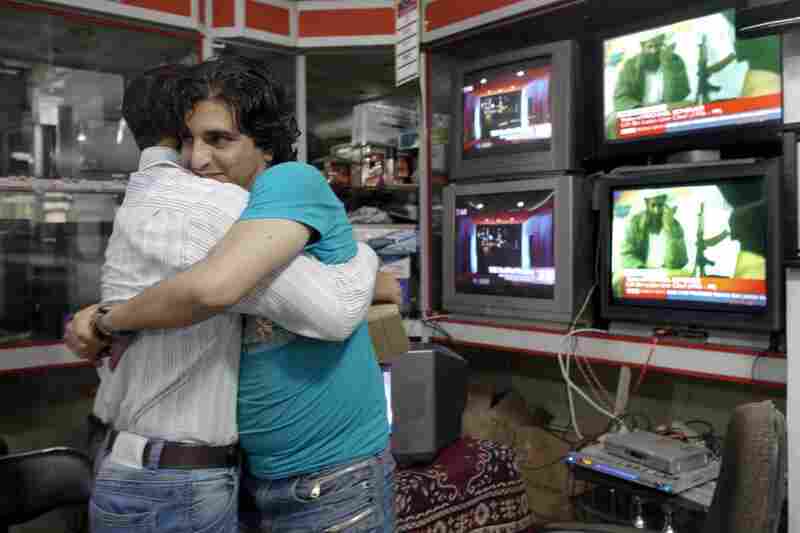 Afghan men hug each other while watching the news of bin Laden's death. Bin Laden was killed in a firefight with U.S. forces at a compound in Abbottabad, Pakistan, early Monday. 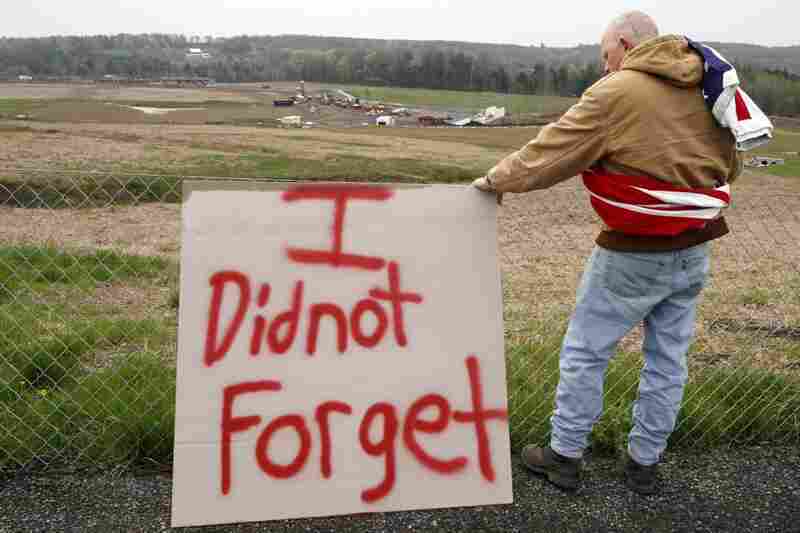 Jeff Ray visits the temporary memorial to United Flight 93 in Shanksville, Pa.
Men in Karachi, Pakistan, buy newspapers reporting the killing of bin Laden. U.S. Marine Staff Sgt. 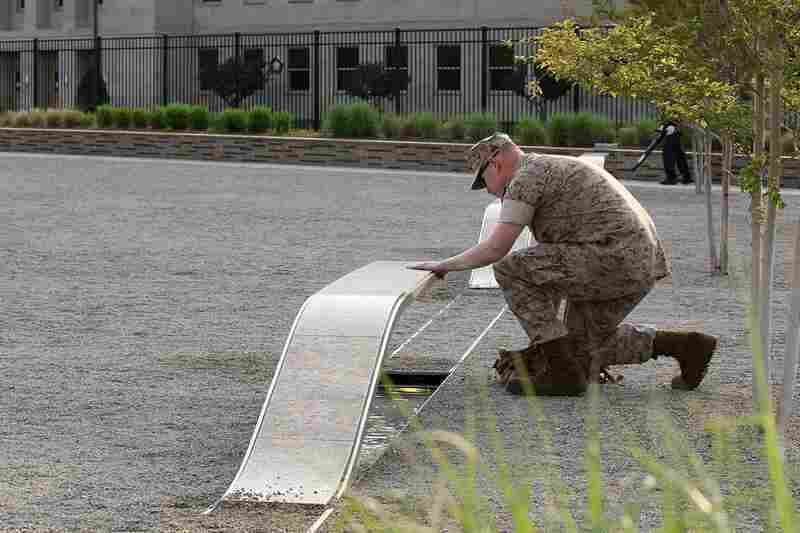 Mark Gamache pays respects to victims of the Sept. 11 terrorists attacks, at the Pentagon Memorial in Arlington, Va.
Bin Laden (center) walks with Afghanis in Jalalabad, Afghanistan, in 1989. The news of his death sent the world into celebration and protest. 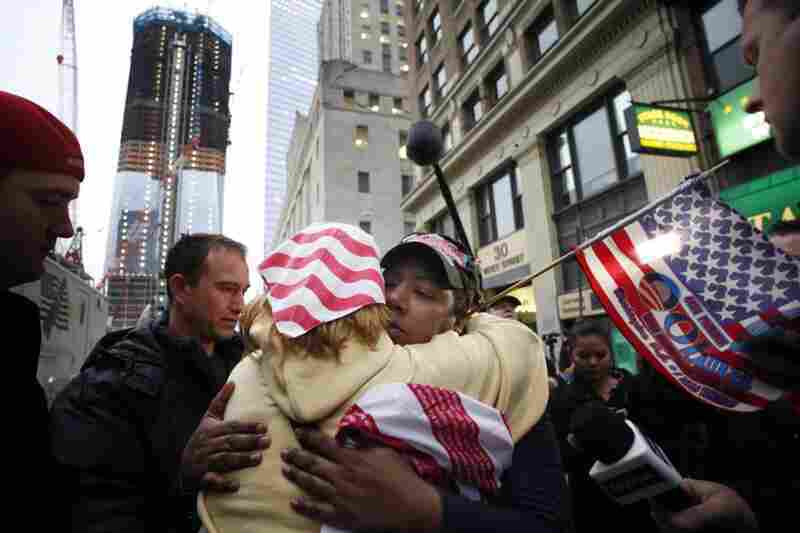 Dionne Layne, facing camera, hugs Mary Power at ground zero in New York on Monday as they react to the news. 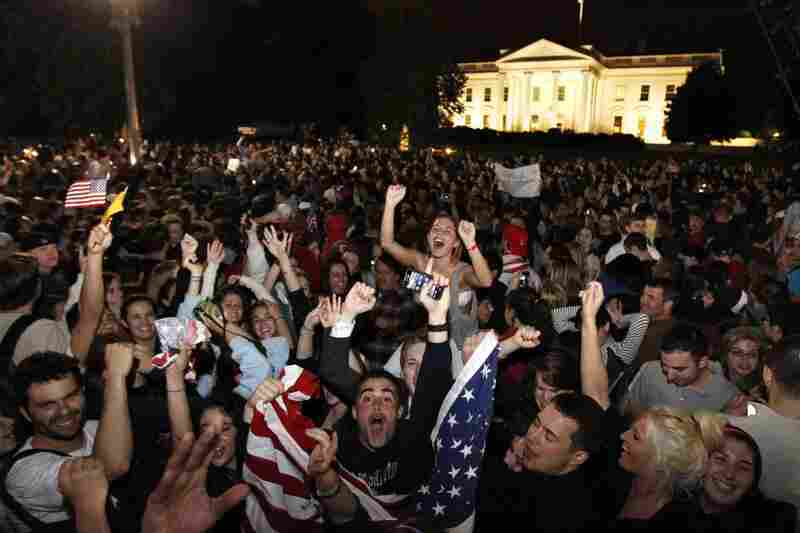 Crowds gather outside the White House early Monday to celebrate after President Obama announced bin Laden's death. 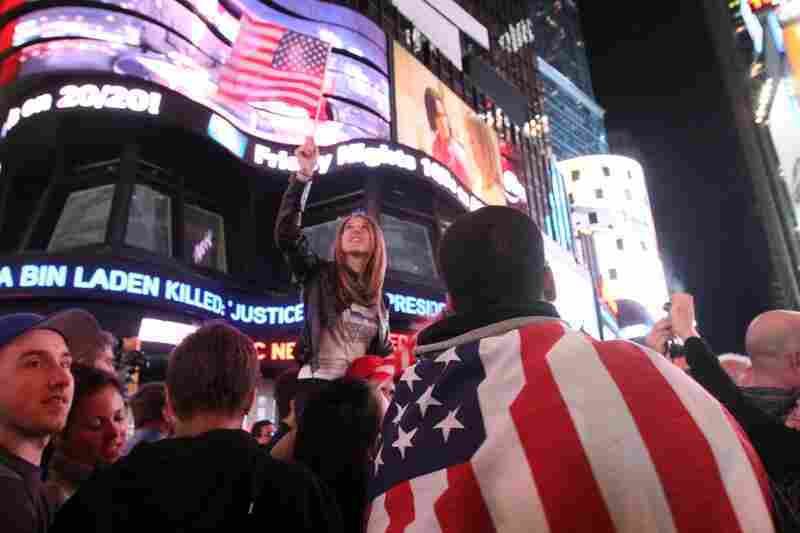 Thousands poured into New York's Times Square when they heard the news. 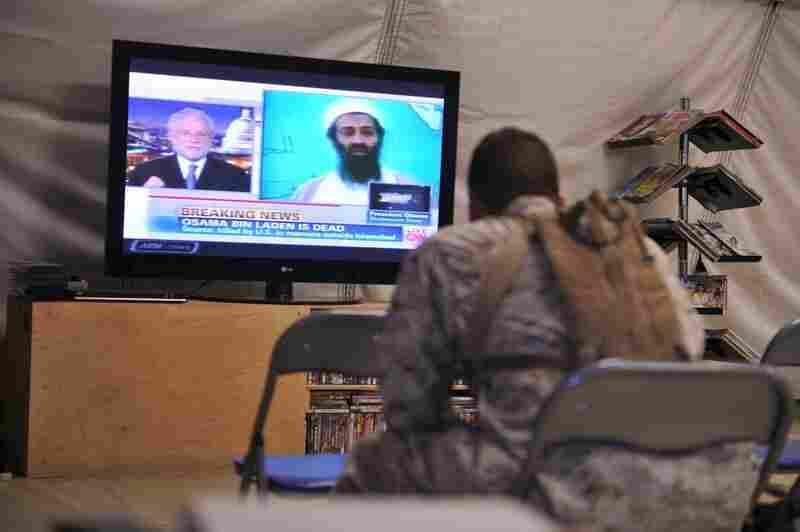 A U.S. Marine watches the news of bin Laden's death at Camp Dwyer in Helmand province, Afghanistan. 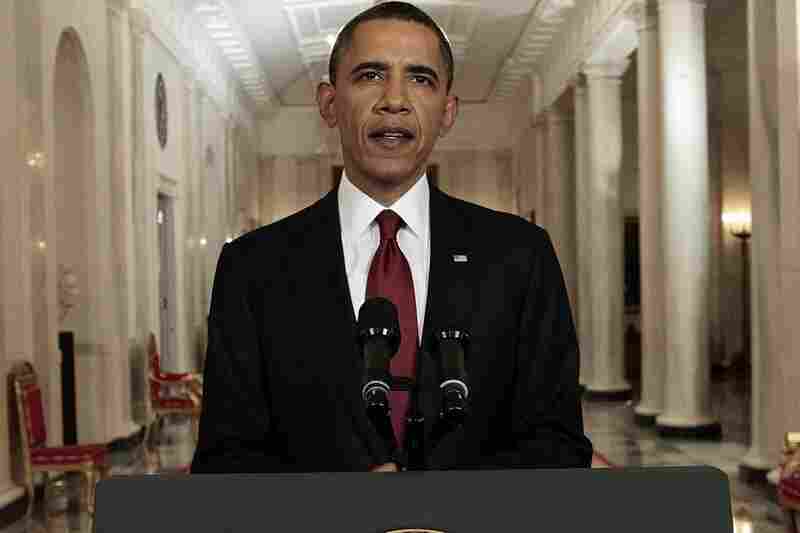 President Obama, speaking from the White House late Sunday night, said U.S. special forces killed bin Laden in a compound north of Islamabad. Several Pakistani presidents have said they didn't know where bin Laden was, notes Fontaine, the former McCain aide. 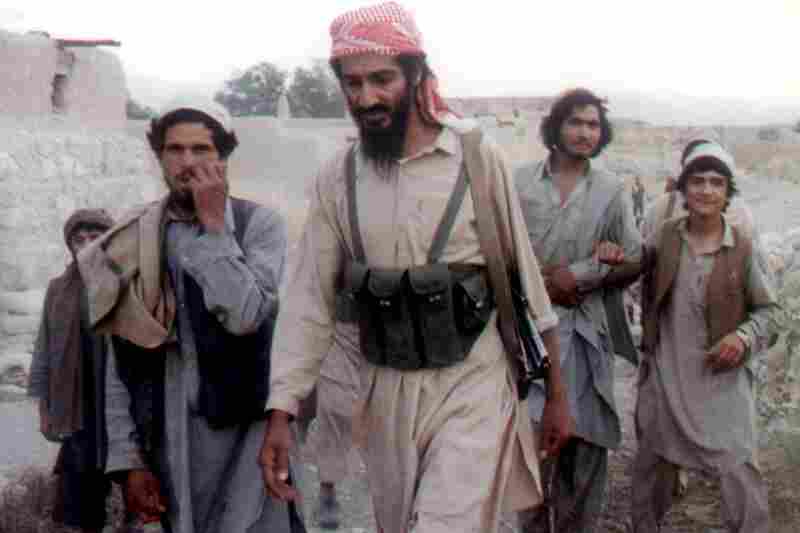 That was easy to believe when it was suspected the al-Qaida leader was living in the mountains of Waziristan, he says. It seems like more of a stretch once it turned out he was living relatively close to the capital in a structure far larger than the local norm, behind high walls topped with barbed wire. "That really deepens suspicions about Pakistani capability or intentions," says Fontaine, who is now a senior fellow at the Center for a New American Security. What Did The Pakistanis Know? President Obama took pains to praise the Pakistani government for its help in fighting al-Qaida in his speech Sunday night. "It's important to note that our counterterrorism cooperation with Pakistan helped lead us to bin Laden and the compound where he was hiding," Obama said. Officials from both the American and Pakistani governments, however, stressed that the operation was a unilateral affair carried out solely by U.S. military and intelligence. Some experts have noted, however, that Pakistan has a history of turning over important suspects, such as Khalid Sheikh Mohammed, the alleged mastermind of al-Qaida's 2001 attacks on the U.S., at key junctures in the relationship. "The timing was suspect," says Sumit Ganguly, a professor of political science and Indian culture at Indiana University. "You could see that around the time when Congress was considering aid; they would deliver us another head." Ganguly says bin Laden was Pakistan's "prime asset" in this regard. And Akbar Ahmed, a former Pakistani high commissioner to the United Kingdom who has served and studied in Abbottabad, insists that some Pakistani officials must have known he was there. He suggests that Pakistan must have decided to turn over bin Laden to repair a relationship that had reached a low ebb. "Pakistan felt this was the appropriate time to play the Osama card, which is to say, 'Let the Americans go after him,' " says Ahmed, who chairs the Islamic studies program at American University. "The trigger was U.S.-Pakistan relations. If ever there was a time, this was it." Ahmed's speculations may not be borne out as the full story of the operation becomes clearer. More analysts suggests that the U.S. kept Pakistan in the dark about the operation because of existing levels of distrust between the countries. But Ahmed's statements do suggest something about the complexities of the bilateral relationship and the difficulty in which the Pakistanis now find themselves. Many Pakistani commentators are already complaining that the U.S. action represents what they consider another violation against the nation's sovereignty, following the long U.S. campaign of armed drone attacks against targets within the country. And because the U.S. is unpopular in Pakistan, suggests Farzana Shaikh, a fellow at the London-based think tank Chatham House, Pakistan has to play down any part it may have played in assisting the American effort. "Pakistan has to say it's purely a U.S. operation," says Shaikh. "While it would like the international community to acknowledge its role in fighting terrorism, it has to be more restrained in promoting its own role because of fierce anti-American sentiment within Pakistan." The U.S. now believes it needs Pakistan rather less than it did yesterday. The question is whether or not the U.S. will continue forking out $1 billion annually to Pakistan. Either way, it's likely that Pakistan will find itself the target for reprisal attacks from al-Qaida and other terrorist groups. Already, the Pakistani Taliban has threatened to kill top Pakistani officials, including Kayani, in retaliation. 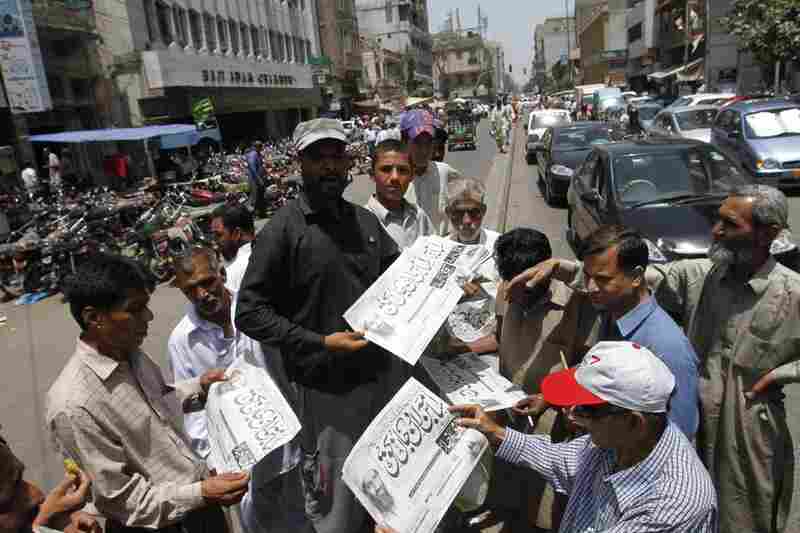 Pakistani has suffered from a great deal of political violence in recent months. But a fresh round of attacks on schools and mosques may be more likely, says Markey, the Council on Foreign Relations scholar. That could lead to renewed calls from Pakistanis to stop cooperating with the U.S. effort there. "Normal Pakistanis will die, and many will say, 'This doesn't serve our interest,' " Markey says. Shaikh says the killing of bin Laden on Pakistani soil will indeed "cause a great deal of soul searching on the part of Pakistan." But she suggests it will also raise questions in Washington. U.S. officials may still need Pakistani help, but "the U.S. now believes it needs Pakistan rather less than it did yesterday," Shaikh says. "The question is whether or not the U.S. will continue forking out $1 billion annually to Pakistan." But many analysts contend that while the U.S. may rethink its partnership with Pakistan, it's not about to break it off. Relations between the U.S. and Pakistan are like those of an old married couple who bicker in private but smile together when out in public. Their differences are real but are put aside, as best as possible, because the stakes of splitting apart would be so high. "The bottom line," says Fontaine of CNAS, "is that the war on terror is easier with Pakistani cooperation than without."